Disclosure: I received the Innotab Max from VTech for review. All opinions are my own. It is amazing how quickly children absorb information. They truly are sponges and I love giving my kids a heads up with educational toys and materials. VTech has proven to be a fantastic resource of learning toys from birth to grade school. The new VTech InnoTab MAX is a hot item on wish lists this holiday season. This kids' learning tablet has been updated quite a lot from our current one. One thing that I noticed off the bat is that the InnoTab MAX comes with a kid-friendly cover with a handle that is removable. 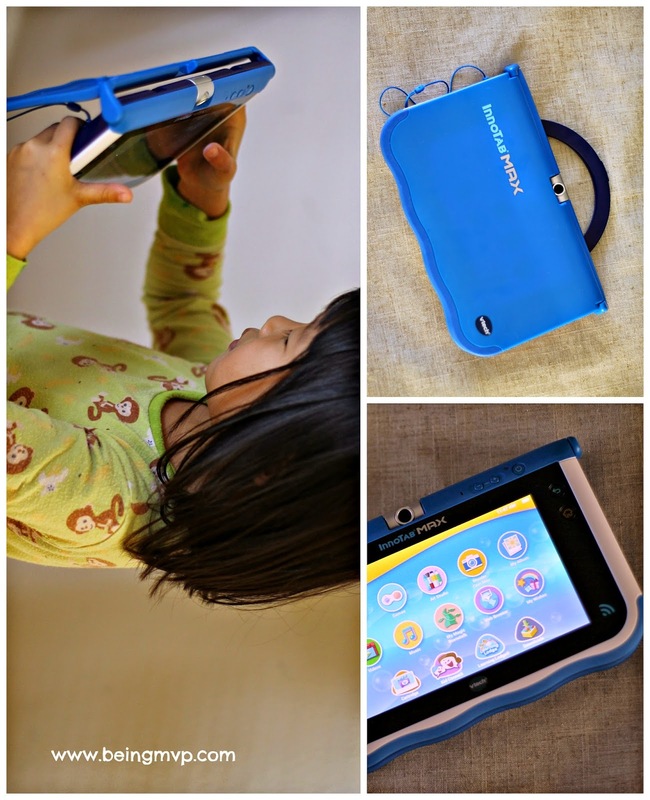 My kids love to tote things around and the durable case puts my mind at ease when the tablet goes mobile. It features a super fast processor and a high-resolution multi-touch screen display. Did you know that kids can actually exchange voice and text messages, photos, drawings, etc. between the tablet and a smartphone? Genius! There are 15 onboard apps included such as Premium VTech® Kid Connect, My Magic Beanstalk, Movie Maker, Art Studio, Wonder Cam Max, E-Reader with Story Dictionary and more. It also comes with one free Toca Boca app and two additional free apps that can be downloaded from the Learning Lodge. Kenzie discovered Toca Boca a while ago and is obsessed! She even makes me play with her and can literally spend an hour in the hair salon 2 and kitchen apps. The memory can even be expanded with a microSD Card up to 32GB. Another neat feature is the rechargeable battery. I can't tell you how many batteries we go through in our household on toys. It's just insane and costly. Don't worry about kids perusing odd and/or inappropriate material because there are parental controls available to manage their apps, web access and tablet time. This is must have for under the tree this year! One winner will Receive a VTech Innotab Max! You have some great recipes on this site! The Dinos! my nephew would be getting this. I also like the VTech Go Go Smart Wheels Ultimate Amazement Park Playset. This innotab would be for my oldest grandson! i LOVE THE WHOLE GO GO SMART WHEELS LINE, AND i WOULD GIVE THIS TO MY SON. I would also love the switch and go dino. 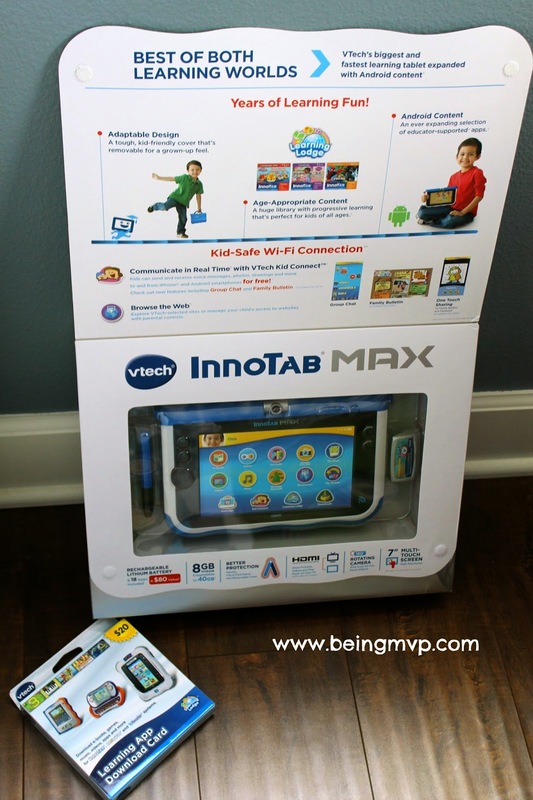 If I won this innotab max, I would give it to my daughter. My boys would love this and the switch and go dinos. 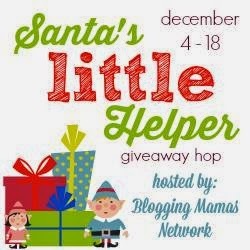 This would be for our little one! We also love the smart watch and go dinos. I love the treehouse hideaway play set and this old be for my son! This would be for my grandson! Would be wonderful to help get him ready for kindergarten next year! He would also love the Switch & Go Dinos Turbo - Bronco the RC Triceratops! I would love to get the Switch & Go Dinos for our son....he loves dinos! I love the Tree House Hideaway Playset. If I won I would give it to my 4 year old son. I would love the Airport Playset bundle. I would give the gift to my cute pie nephew. I like the Kidzoom Smartwatch for my daughter! I like the MobiGo 2 and it would be for my daughter. I like the kidsmart kidzoom watch- very nice! I would love to give one to my nephew. I would give this to my daughter. I also love vtech's go go smart animals. I would give the Max to my son if I won and he would also love the have the Kidizoom Smartwatch too. I like the smartwatch! and my daughter would enjoy this! I love all of the Go Go Smart Wheels sets! I'd give this to my 3 year old son. I love the treehouse hideaway play set, for my nephew! I love the kidizoom watch and my son would go nuts over this! Thank you for the amazing chance, my son and daughter would be sharing this wonderful prize! we love all the vtec toys its hard to decide on just one, probably the RC Dino for my son, we always end up with more girly toys then toys for him..
this would be for my daughter but I also love the go go dinos!!! i love the 3s folio case with rockets! it would be for my son :) thanks! Both of my kiddos really want a Kidizoom Smartwatch. I would give the Innotab Max to my oldest daughter. The Innotab would be for my son - he'd also love a Switch n go dino! I would also love to try the Kidizoom Smartwatch! This would be for my nephew! If I am lucky enough to win the Innotab Max would be for my 3 year old son.I think we would also like the Kidizoom Smartwatch! I think the vtech kidizoom smart watch looks awesome! This would be for my son! This would be for my youngest son. I also like the Kidizoom Smartwatch. The switch and go dino's look fun, I would give this to my 3 year old. My son has a switch n go Dino coming! I can't wait to play with it with him. I would be giving the innotab to my daughter if I won. She is the perfect age for it. I like Animal_Friends_Infant_Gift_Set and if I win I would give this prize to my nephew. I would love to have the Go! Go! Smart Wheels Train Station Playset. If I win I would give this to my son. My kids would love the Dinos! I would like the Innotab3 also... and this would be for my granddaughter. I would give the Innotab to my nephew. I would also like to get the Lil' Critters 3-in-1 Baby Basics Gym. My son would love the switch and go dino! My son would love the Innotab! My daughter wants the Kidizoom smart watch! I also like the MobiGo 2 Touch Learning System Pink and the InnoTab Max would be for our dd! I like the Go Go Smart Wheels and would give this prize to my daughter. I would love to have the KIDIZOOM SMARTWATCH for my daughter! This looks like it has so many features that she would love to use! I would also love to win this tablet for her! I love that VTech combines learning and fun! My daughter would love the kidszoom camera! I would give the Innotab to my nephew, if I win. I also like Span the Spinosaurus - Switch & Go Dinos. My son would also love the Kidzoom Smartwatch. The Innotab would be for my 3 year old. My four children would share the Innotab. My daughter would also love the Vtech Kidizoom Smartwatch. I like the tote and go laptop. If I won, this would be for my granddaughter. I like the Smartwatch for my son. I like the Forest Adventure playset. This would be for my 3yo son. I also like the Kiddizoom Smartwatch. If I won, this would be for my son. This would be perfect for my little girl!!! I would love the tug and teach sail boat for bath time!! I like the Zoo Explorers Playset + Junior Track Set Bundle. If I won I would give this to my niece. The Kidizoom watch looks really neat, I would love to give this to my son!! The Bronco Digger Switch and Go Dinos Bundle looks like it would be fun for my grandson. I have gotten 3 of my grandkids a VTech and they love them, now my granddaughter is old enough for one, so she would be getting it. My youngest son has the T-Rex Switch 'N Go Dino on his wish list. If I win this would be a gift for my three children to share. We love the switch n go dino's. Gotta get that wooly mammoth. I also like the Go!Go! Smart Animals. This would be for my younger kids to share. The Kidizoom smart watch looks really cool! This would be for daughter if I win! My son would be getting the tablet. I love all of the Go! Go! Smart Wheels vehicles. My son just has one, but he loves it. My son would love this! I would also like the Bronco Digger Switch and Go Dinos Bundle or the Fire Command Rescue center for my kids. I would also love to have the Kidizoom Smartwatch - Sky Blue. I would give it to one of my little ones. I love the switch and go dinos. This would be for my daughter! Rafflecopter won't let me resubmit and entry I made an error on. Here is the link to my Crafts pin. I like the Catch Me Kitty. I would give the Innotab to my 4 year old granddaughter. My daughter would like the smartwatch. I also love the switch and go Dino. This would go to my little girl. She would enjoy it so much. I would give this to my son. He is always getting 2nd hand from the girls, he needs one for himself! The gogo smart animals are pretty cool too. I would love the Zoo Explorers Playset. I would also like the Garage Bundle with FREE Vehicle and if I won this would be for my grandson,Nolan. I love the Vtech Kidizoom Smartwatch. Vtech is great for little minds. 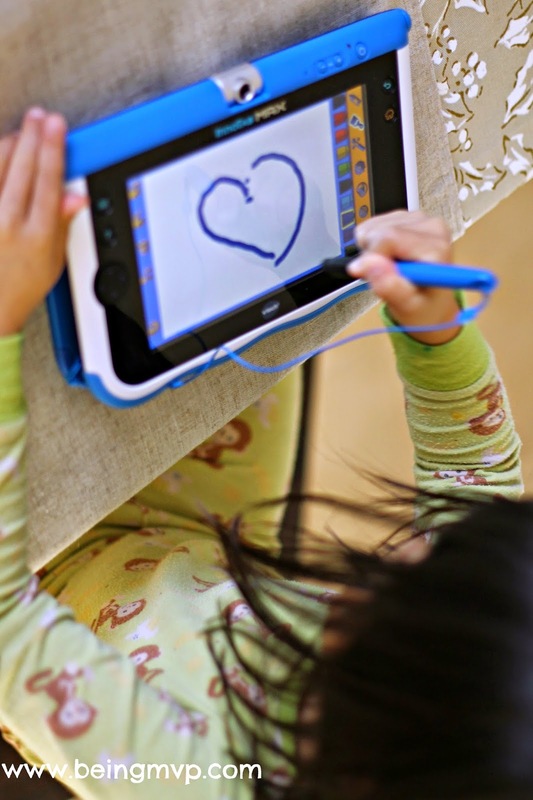 I would love the InnoTab 3 Baby, great for my youngest child. I like the Tote & Go Laptop. If I won I would give it to my nephew. I would also love the Treehouse Hideaway Playset and this would be for my daughter. Vtech Smartwatch! This would be for my cousin! I like the Vtech Kidizoom Smartwatch. I would give this to my daughter if I won. I like the go go smart wheels for my son. This would be for my daughter. The Innotab Max would be for our little girls. I also like the Light-Up Baby Touch Tablet - Pink. The Switch and Go Dinos are really cute too! Also, this would be for my niece. I love the Vtech Sit-to-Stand Alphabet Train. I would give this to my son and or daughter! It depends on who would enjoy it more! I love the switch and go dinos. I would love this for both of my kids. I love all of the products, but my youngest would really enjoy the Zoo Explorers Playset. I'd love the Preschool Alphabet bundle for my super smart daughter! I also like the Vtech Kidizoom watch. My daughter would love this prize. I would give this to my son and I love the zoo! My grandson would like the Kidizoom Smartwatch - Sky Blue. This would be for my granddaughter. I want the InnoTab 3S Plus and it would be for my daughter Natalia. I also like the V tech smart watch. I love the Busy Learners Activity Cube! I would give this to my cousin if I won! My boys would love the Switch and Go Dinos. If I won, this would go to my 3 year old. my son would love the switch and go dinos! and this would be for him as well!